According to the ARD, wind park developers are simply steamrolling over local residents who oppose them, and installing the giant machines less than a few hundred meters away from homes, and many natural places where they don’t belong. And even though there is no longer a demand for wind power in northern Germany, windparks continue to be built. Often turbines are shut down so as to not overload the grid (but they get paid no matter if they run or not – which is why they keep getting built). 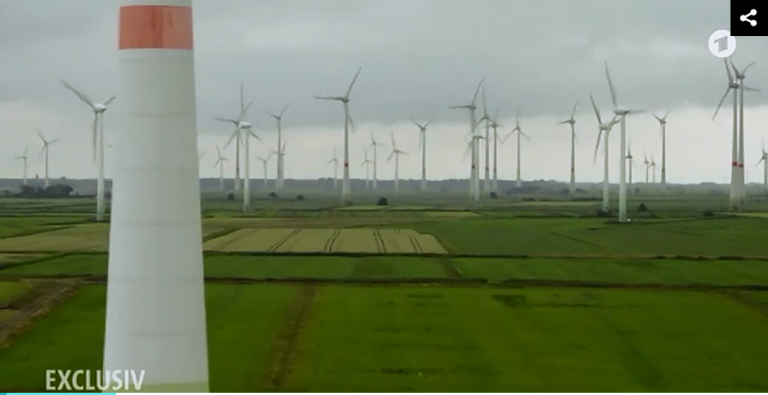 At the 4-minute mark, one community in south Germany (Erlangen) actually installed wind turbines where there is not even enough wind for them to make a profit. Here the message of being “green” (and making easy money at consumers’ expense) trumps common sense. The madness knows no end. And there are plans to build even more in the area. With all the madness, the ARD reporter says at the 5:30 mark that it’s no wonder that trust in wind parks is disappearing in Germany. Another problem, the report states, is that often wind parks are approved by politician’s who have a direct interest and business dealings in them, meaning the industry is rampant crony capitalism – the very kind that Germans are typically famous for opposing. For example Rannungen mayor Fridolin Zehner had a wind turbine built where none is supposed to be built – on his own land – thus allowing the honorable mayor to cash in on lucrative leasing fees – to the tune of 10,000 euros annually. The same type of sweet deal was worked out by town councilman Egon Sendelbach in Urspringen. Germany-wide local politicians and twoncouncilmen are profiteering from windparks at the full expense of the citizens and the common good. Sendelbach tells ARD he has no problems with it. Research shows that we have a massive problem with the help-yourself” mentality when it comes to the zoning of wind parks. Many mayors and town councils vote in a way where they themselves profit. The extent of the problem is frightening and is nationwide. At the 20-minute mark, the ARD focusses on who ends up paying for the wind energy bonanza: the struggling consumers (like Nina Albig) who are seeing their electric bills skyrocket. Albig has seen her electric bill double since 2008 and is no longer able to afford it. Now the power company is threatening to cut her power off. Like so many other Germans who used to support rescuing the climate, she is “having doubts about the Energiewende“. We need the wind turbines in order to save the foundations of our life, to rescue this planet, and our children! Increasingly persons like Hofreiter are finally beginning to be depicted by the ARD and Germany’s once ultra-green media as the charlatans of yesterday, still peddling snake oil that has long lost its magic. It turns out that at the protest rally in Berlin most of the protesters who showed up were wind industry workers who were paid a day’s wages to show up – travel and accommodation costs included. Also speaking at the rally was the BUND itself. It’s all about massive business interests. Totally massive business interests. Never have I experienced from any other lobby such a brutal approach, that parliamentarians have been pressured so much because of personal interests. 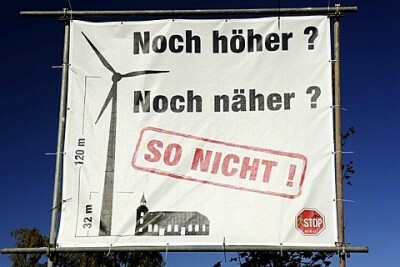 Germany’s once loved wind industry is now looking more and more like a hated villain. Which part of ‘nicht’ are they having trouble with? The reason I started actively campaigning against wind and the stupidity over climate was because having worked in the wind industry, I knew they told lies, but I also knew the greens and most politicians were “in love” with wind and would roll over backwards to get more. A dishonest industry – with no one in power prepared to scrutinise what they were doing – it was certain there was going to be corruption and a lot of it. I have also heard comments in the media this evening stating that we should be more concerned with the growing frequency of freak weather events. If the weather is becoming increasingly harder to predict, WHY ARE WE TRYING TO RELY ON WEATHER DEPENDENT RENEWABLE ENERGY?!!! Same thing happened in the city of Rotterdam. They placed a huge wind turbine near the ‘van Brienenoord’ bridge. Very close to offices and such. This is within the city limits! Astonishing how long it has taken those blinded by “save the planet” zealotry just how destructive, costly, corrupt and dangerous industrial wind really is. Glad to hear the true story is finally being heard. Conservation groups in Australia have also been duped and co-opted by wind energy, it has taken a few years but they are completely infiltrated. Time to wake up guys!